1 of 6 Soak plank in cool water for 10 minutes, weighing down with a heavy object to keep submerged. 2 of 6 Heat gas grill to medium or charcoal grill to medium coals. 3 of 6 In small bowl, stir together brown sugar, soy sauce, the clove of minced garlic and the sesame oil. Set aside 2 tablespoons sauce for serving. 4 of 6 Once plank is done soaking, place salmon fillet on plank, skin-side down, and brush with half of remaining sauce. Transfer plank to grill and cover. Grill 10 minutes; if plank chars too much, mist with water. 5 of 6 Uncover grill; baste salmon with remaining sauce. 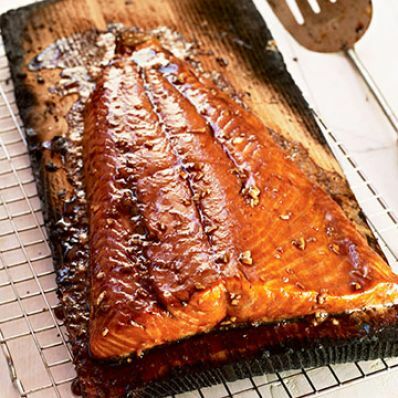 Cover grill and continue to cook 15 minutes or until fish registers 130 degrees F on an instant-read thermometer and flakes easily with a fork. 6 of 6 Meanwhile, heat oil in a large nonstick skillet over medium heat. Add the 2 sliced garlic cloves and cook 1 to 2 minutes. Add bok choy, salt and pepper and cook an additional 2 to 4 minutes, until tender and cooked through. 1 of 1 Slide a spatula between fillet and skin and transfer to a platter. Drizzle with the 2 tablespoons reserved sauce; serve with bok choy on the side.